Engineering drawing for civil work and shed for the machine installation. 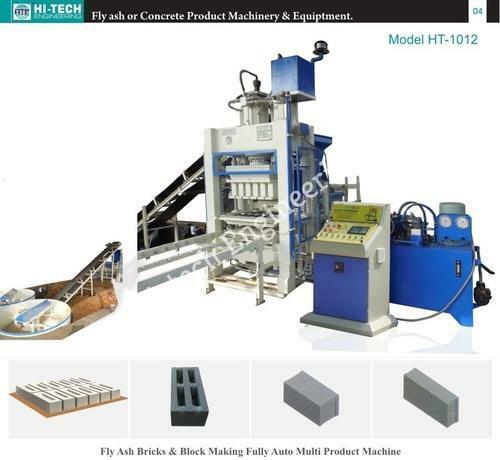 Established in the year 1983, at Morbi (Gujarat, India), we, “Hi-Tech Engineering”, are a well-known manufacturer & Exporter of a superior quality range of Fly ash Bricks Making machine, Automatic Fly ash Bricks Making Machine, Solid Block Making Machine, Hollow Block Making Machine, Vibro Compacting Machine, Cement Block Making Machine, Paver Block Making Machine, Colour Mixer, Pan Mixer, Automatic Vibrating Machine and Egg Laying Machine etc. Empowered with a well-equipped infrastructural unit, we are capable of supplying the most durable product range of the uppermost quality. Our offered range is developed by a team of skilled and knowledgeable personnel who leave no stone unturned in order to offer flawless range of products. Our products are reckoned for valuable features like sturdy construction, longer service life, high tensile strength, excellent efficacy and optimum performance. Customers can avail the offered machines from us at highly effective prices.